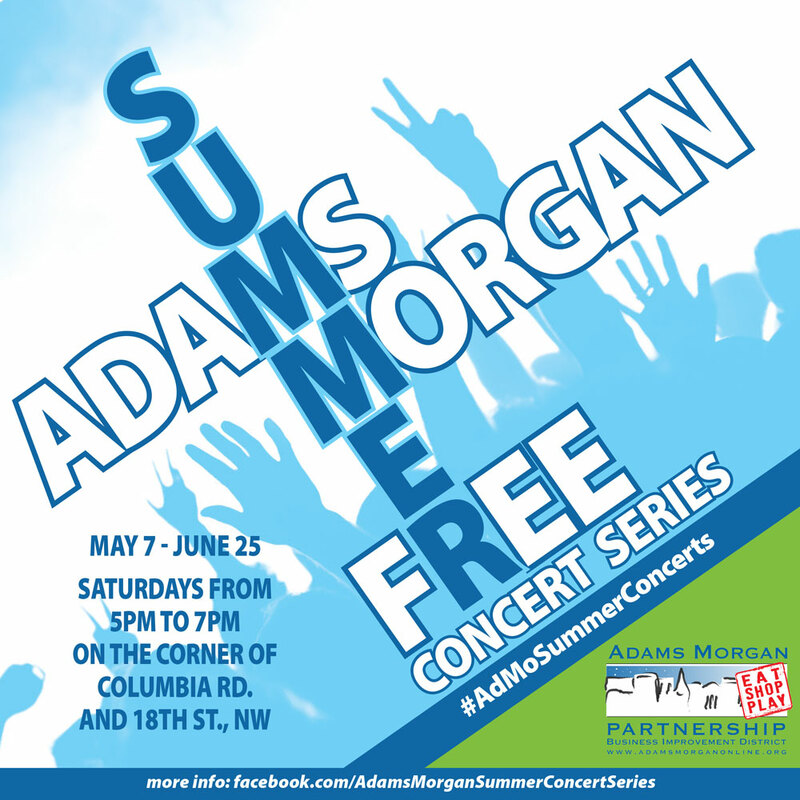 The Adams Morgan Partnership BID continues their popular Summer Music Series with an eclectic range of local musical talent on Saturdays (except Memorial Day weekend) in May and June from 5:00 - 7:00 PM at the corner of 18th Street and Columbia Road, NW. Expect a wide range of music styles and back by popular demand - HULA HOOPS! We will have a dozen hula hoops each Saturday for adults and kids of all ages to shake your groove thang! We will also have small bottles of bubbles for kids of all ages. Artist playing the series are: Boat Burning http://www.boatburning.com; Hollertown http://www.facebook.com/hollertown; Oxymorons http://www.facebook.com/OxymoronsDC; Jelly Roll Mortals https://www.facebook.com/jellyrollmortals; Goin’ Goin’ Gone http://GoinGone.net; Dave Ihmels and Friends www.DaveIhmels.com. “Playing outside during the day, means families can bring their kids, and neighbors can connect” says Doug Hartnett, who's band performs on May 21st. “Adams Morgan is known for celebrating diversity, and our music is a great match for that” says Scott McKnight of the Jelly Roll Mortals playing on June 4th. Seating is limited, and is first come, first serve, so show up early! Please feel free to bring your own beach chair. In the event of rain, the concert will be canceled for that day. Due to the nature of the series, there will not be a rain date. Attendees will be encouraged to stick around after the show and save some money! 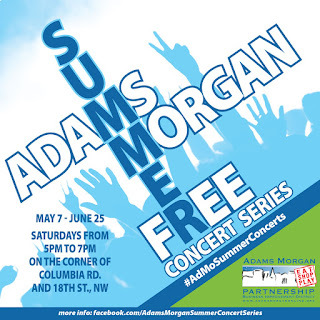 Adams Morgan Partnership BID will be distributing wristbands that will entitle the wearer to discounts on food, drink, and merchandise at a variety of participating Adams Morgan merchants. A list of discounts and participating businesses will be available at the concert. All Adams Morgan businesses offer FREE daytime parking validation (no purchase necessary) in the Colonial parking garage (access is from 18th Street, NW on the east side just north of Belmont Road, NW) for up to four hours for only $8.00. Park at the garage, take the ticket from the garage, a business owner will give you a card with four hours validated then return to the garage and pay only $8.00. No need to drive around looking for parking. The price in the garage is the same as the meters with validation. This deal is available seven days a week until 5 PM when regular rates begin to apply. The validation is only good for up to four hours, any fraction thereafter, whether before 5pm or not, will incur the maximum fee. If you only want to park for up to two hours - there is a validation for that also. For up to two hours, businesses will give you a validation card whereby you pay $4.00 when you return to the garage. Take the Red Line to the Woodley Park/Adams Morgan Metro Station. Then, it’s only a 10-minute walk across the historic Duke Ellington Bridge. For more information, visit www.wmata.com. Take the Circulator Bus from the Woodley Park/Adams Morgan Metro Station or take it to the Columbia Heights Metro Station. The Circulator runs every 10 minutes; hours are until midnight Sunday through Thursday and until 3:30 AM on Fridays and Saturdays. The Circulator costs $1.00. For more information about the Circulator Bus visit: www.dccirculator.com or https://www.facebook.com/dccirculator/. Also, Metrobus Route 42 and any of the 90 buses go through Adams Morgan. For more information, visit www.wmata.com.